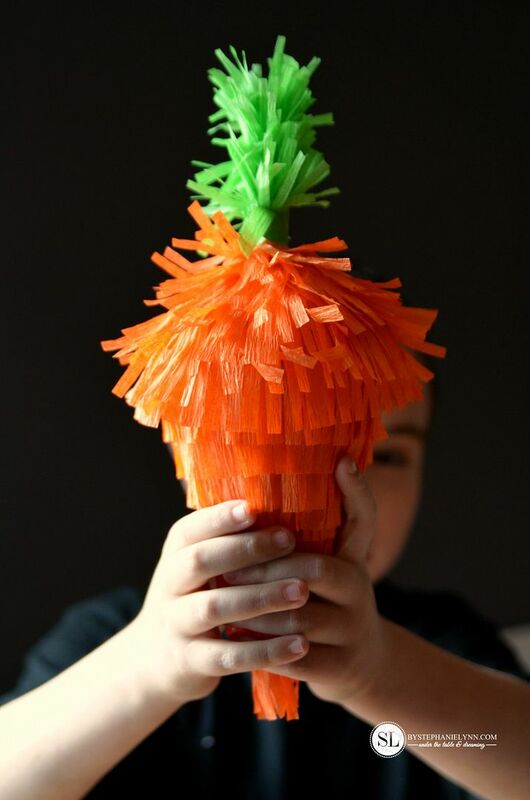 Mini Easter Piñatas – make your own carrot piñata #DisneyEaster | This shop is sponsored by #CollectiveBias and its advertiser. The story and opinions read here are entirely my own. 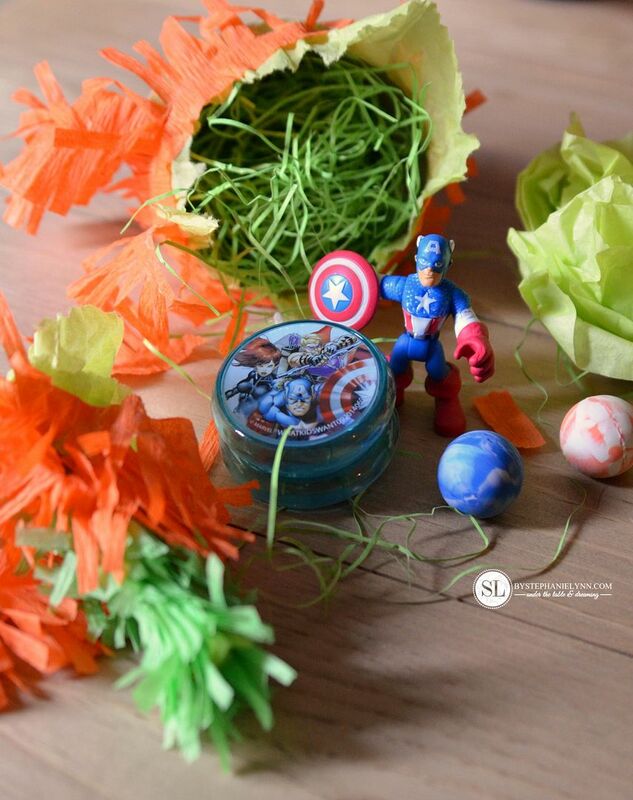 Spring is officially here and I’m really looking forward to celebrating Easter. 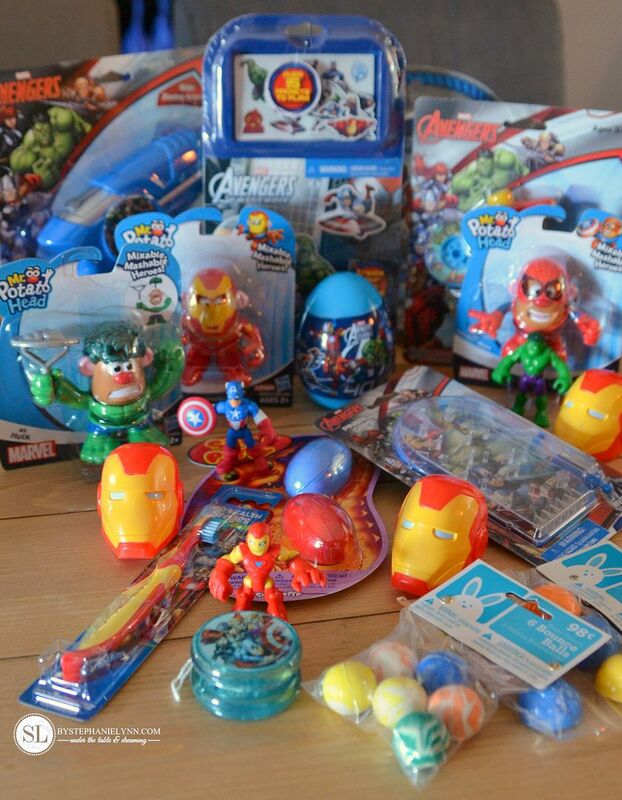 Since it is right around the corner I already started putting together an Easter basket for my little guy. 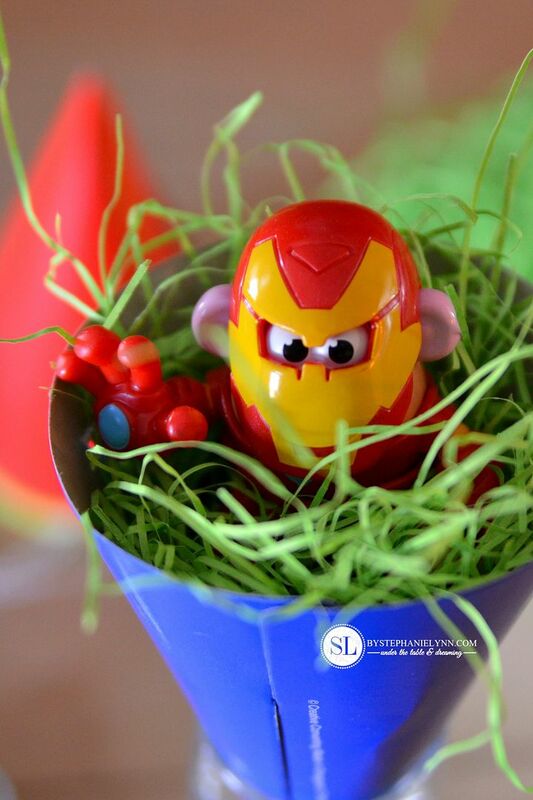 Each year I enjoy creating a basket centered around a theme and this year is no different. CJ loves to open things right now. 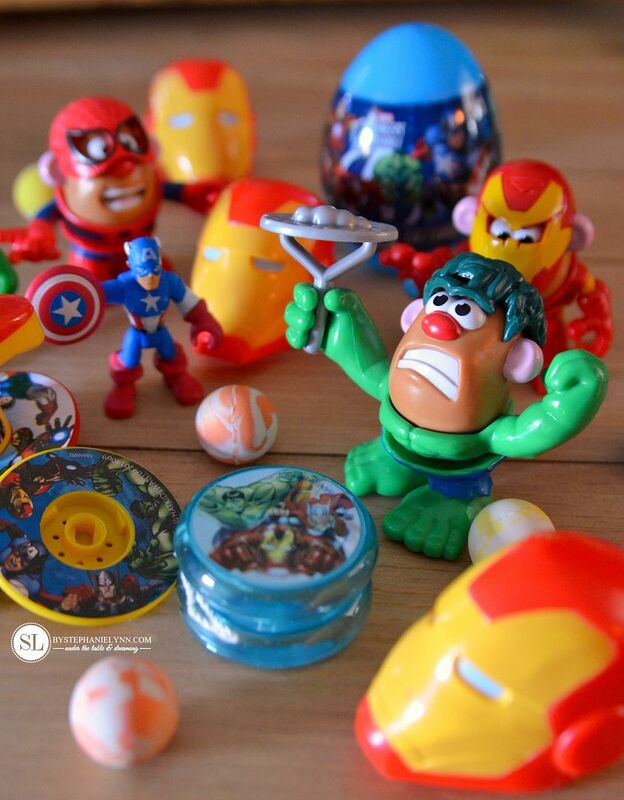 Not just presents – but anything that comes inside of any type of packaging. He is mesmerized by the whole ‘opening’ process. 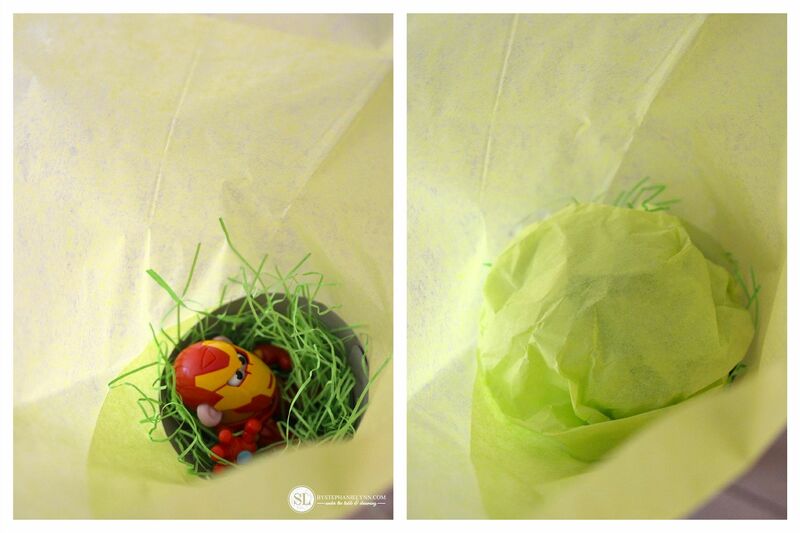 So this year I thought I would put a little spin on his basket and created a series of Mini Easter Piñatas for him to open up. (no sticks required or even that gooey paper mache ). The best part is they are super easy to put together and require just a few inexpensive supplies. 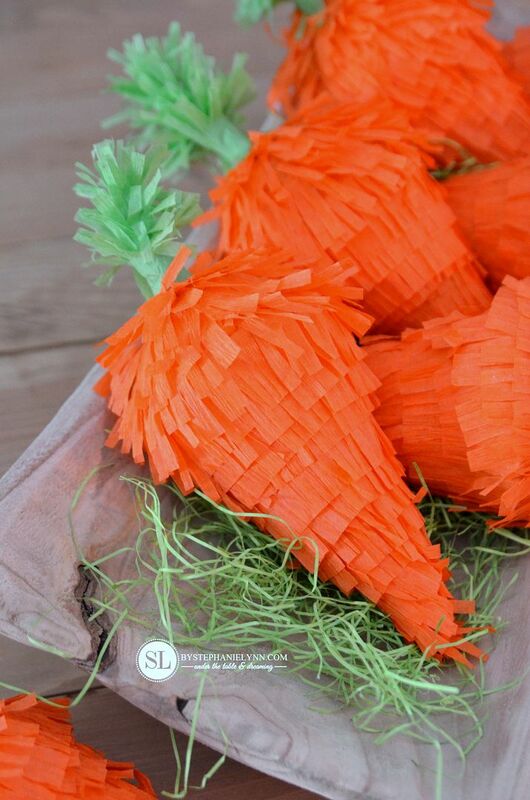 Step One: Gather small toys and trinkets to fill the piñatas. Step Two: Remove the strings from the party hats. 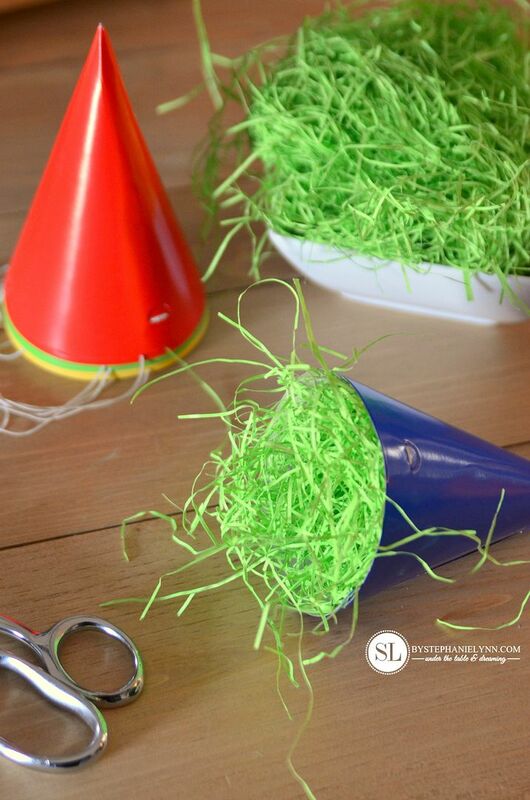 Fill each hat with Easter grass or shredded paper. Tuck in a toy or trinket. Step Three: Cut a sheet of tissue paper in half. 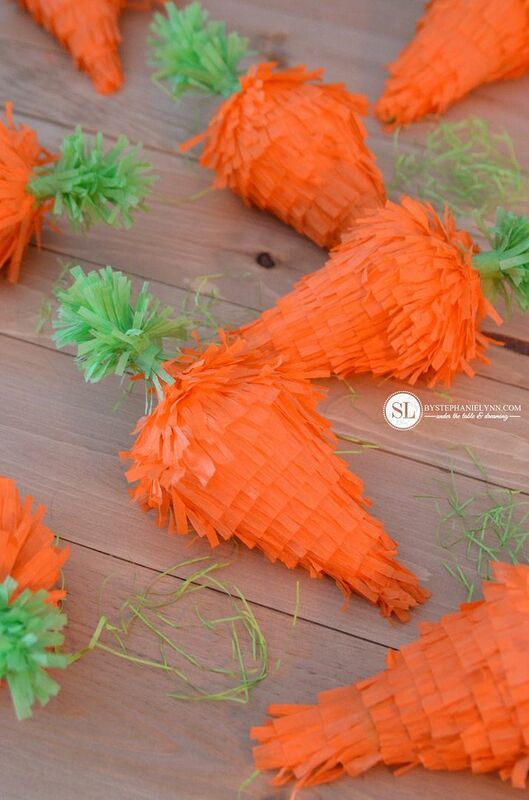 Wrap the (half) sheet of tissue paper around the party hat – leaving the top open – creating a cone shape. 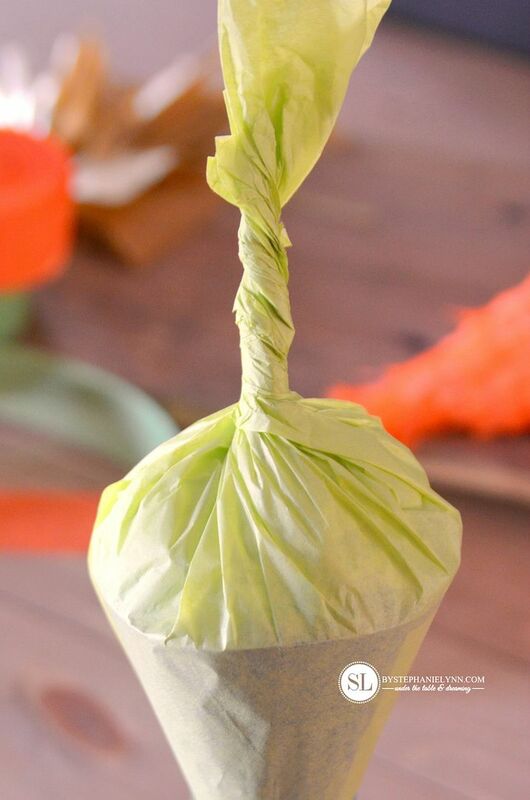 Take the other half of tissue paper, crumble it in a ball shape and place it inside the cone – on top of the trinket. 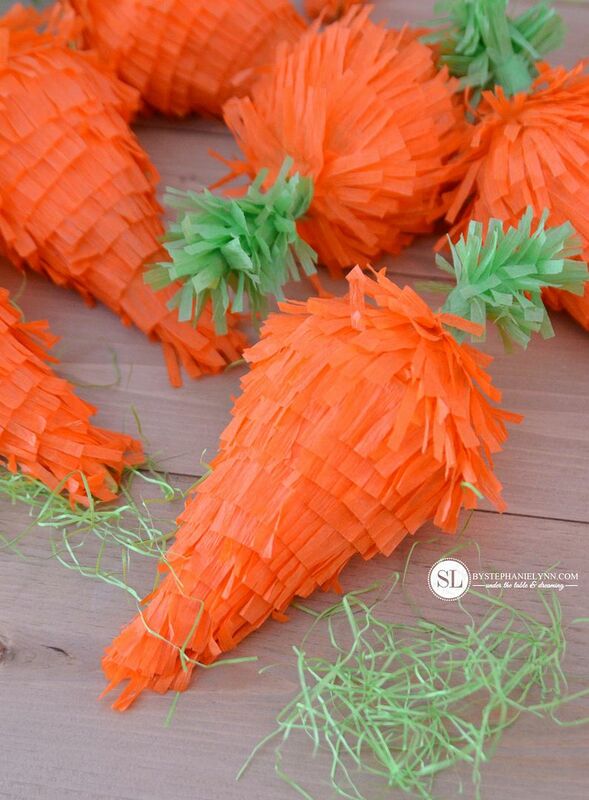 **This piece of tissue will help create the round-shaped top of the carrot. 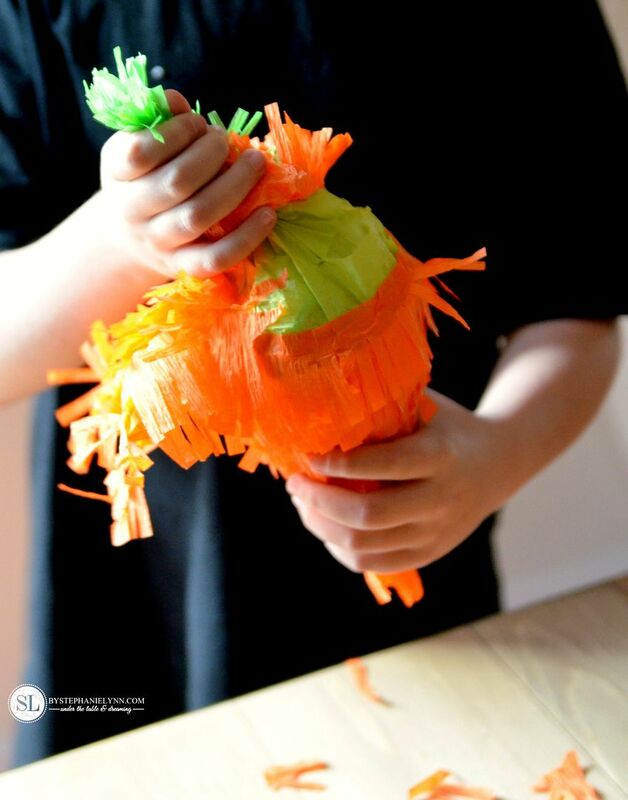 Twist the remaining tissue to seal the top of piñata – as shown above. Step Four: Cut a long piece of orange crepe paper streamer. 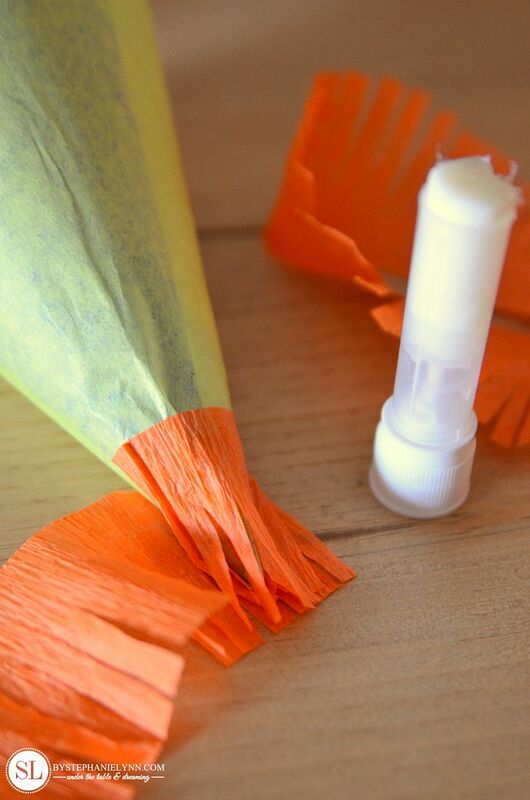 Fold the streamer multiple times – keeping all of the layers evenly aligned. Fringe cut the bottom of the streamer with scissors. Each cut should go about 3/4’s through the folded streamer and be evenly spaced, as shown above. 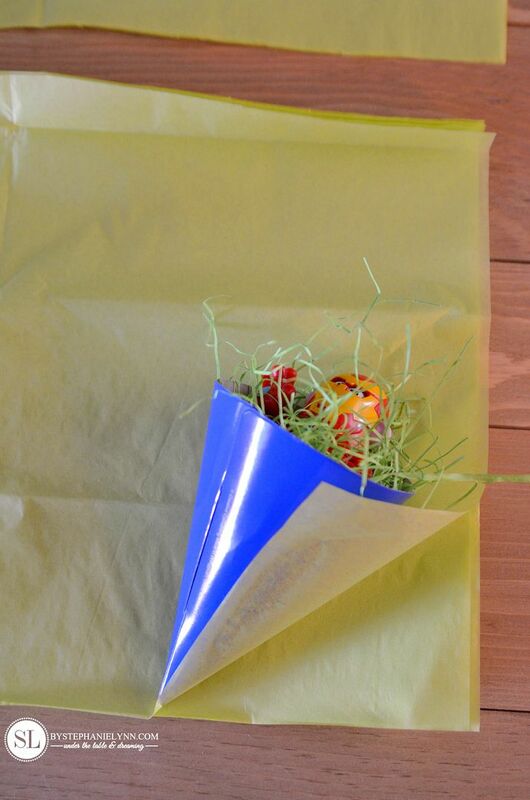 The crepe streamers can become pretty thick once they are folded. 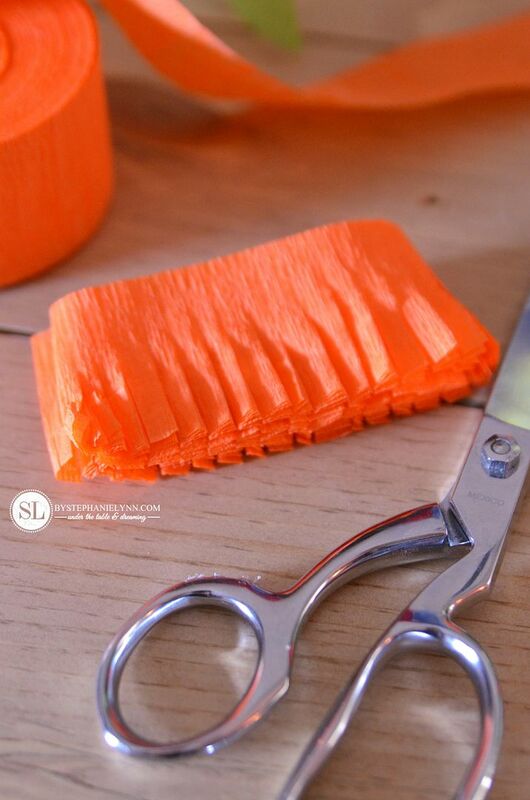 Use a heavy pair of shears if you can or simply use smaller sections of crepe paper for nice clean cuts. Step Five: Starting at the bottom point, begin wrapping the fringed streamer around the cone. A regular glue stick works perfectly fine since both materials are light weight. Layer each round slightly higher then the last – ensuring the green tissue is completely covered. 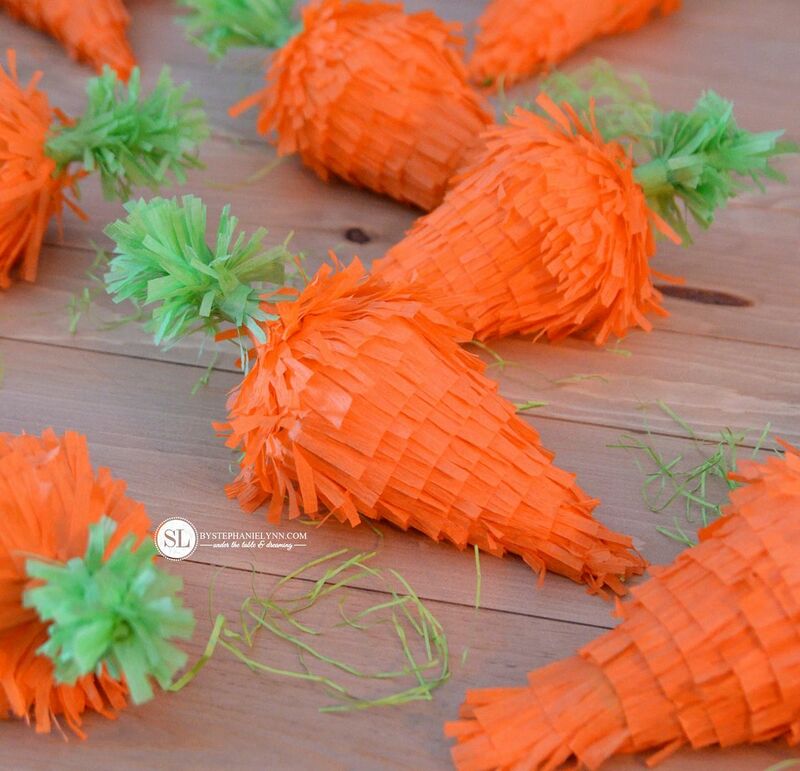 Continue wrapping the fringed streamer all the way up to the bottom of stem. 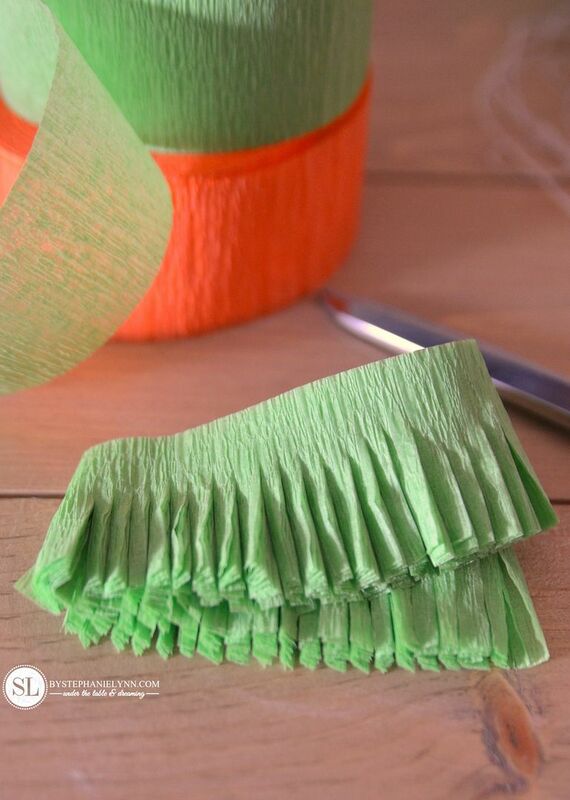 Step Six: Fringe cut a piece of green crepe paper streamer, as outlined above for the orange. 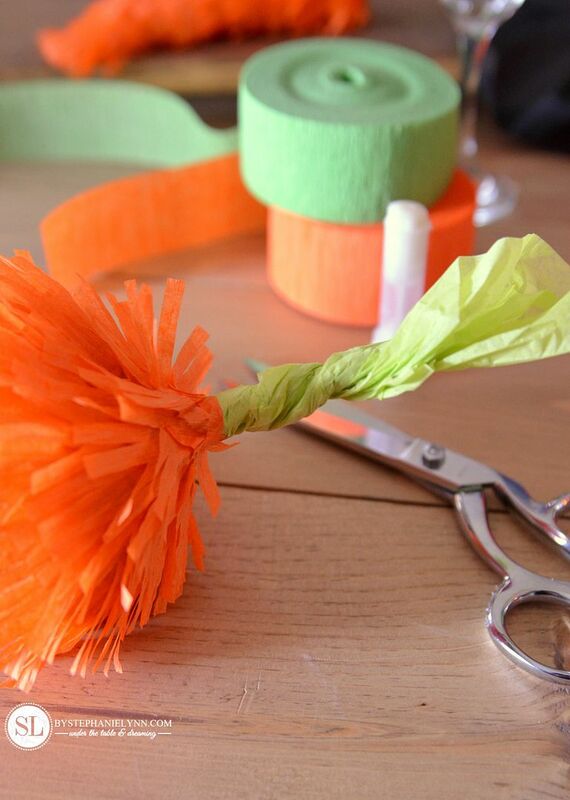 Trim the stem with scissors to a proportional size. 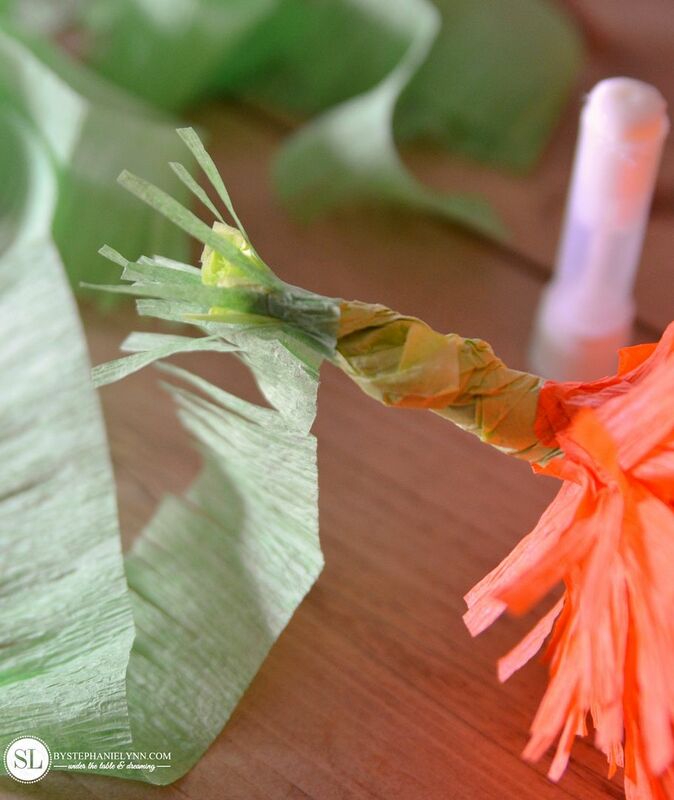 Unfold the streamer and begin wrapping the stem – starting at the top. 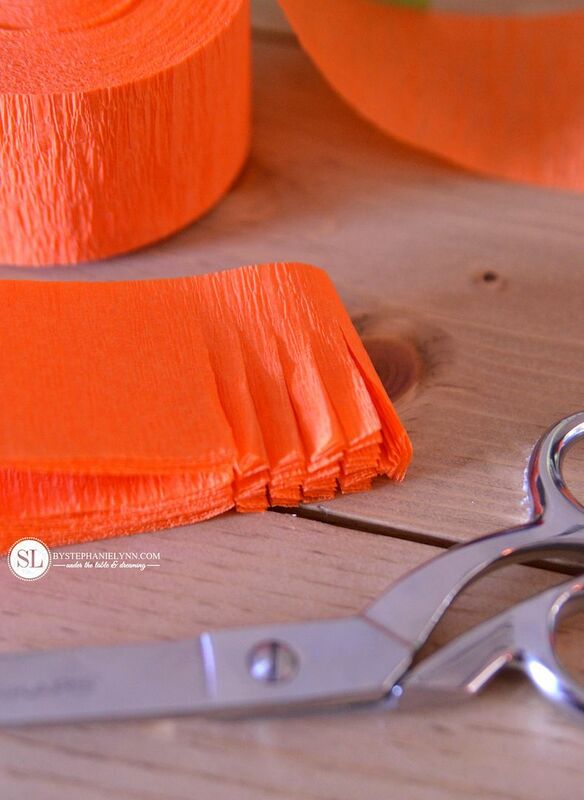 The fringe should be layered in the opposite direction of the orange fringe, as shown above. 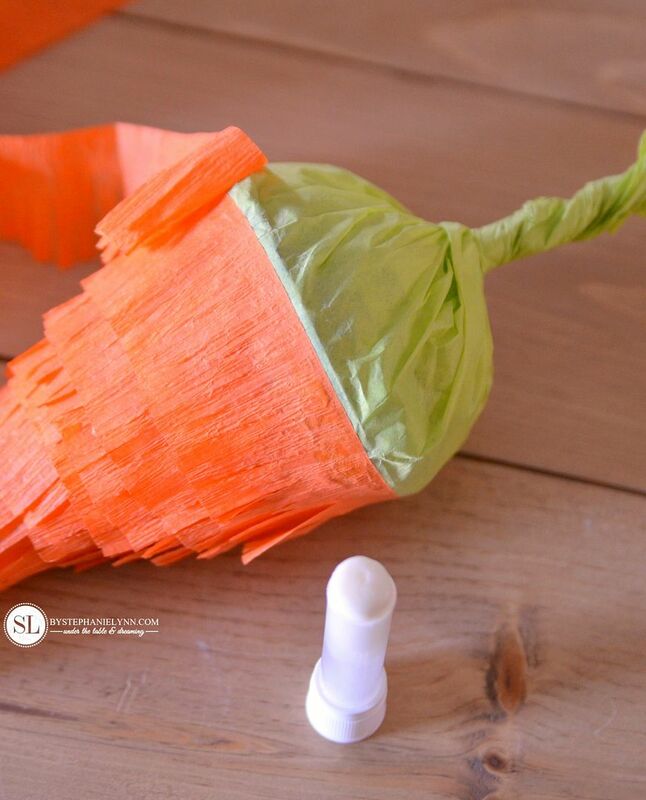 Continue wrapping until you reach the bottom – then fluff the tissue. 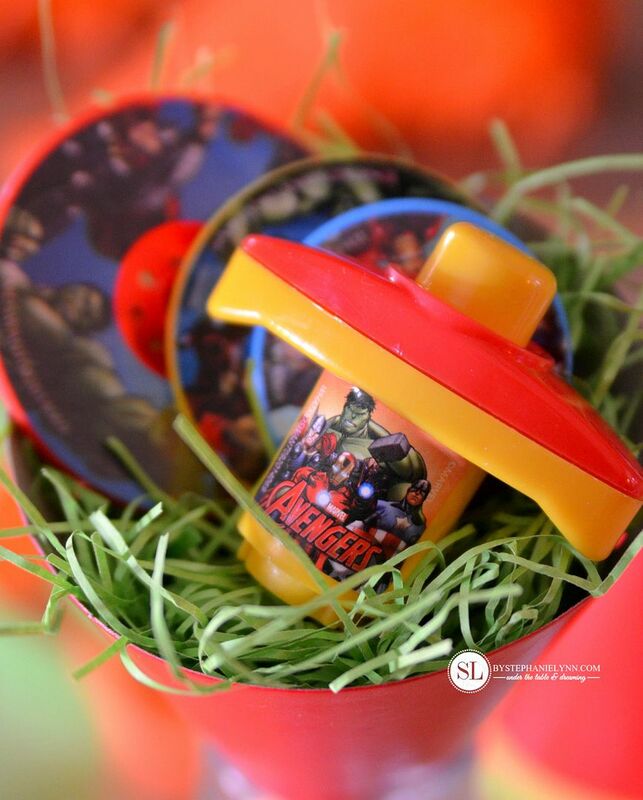 Since my little guy is crushing on the Marvel Heroes right now that is going to be the theme of his Easter basket this year. I was able to find a good amount of small toys and trinkets to fit in the piñatas at Walmart. 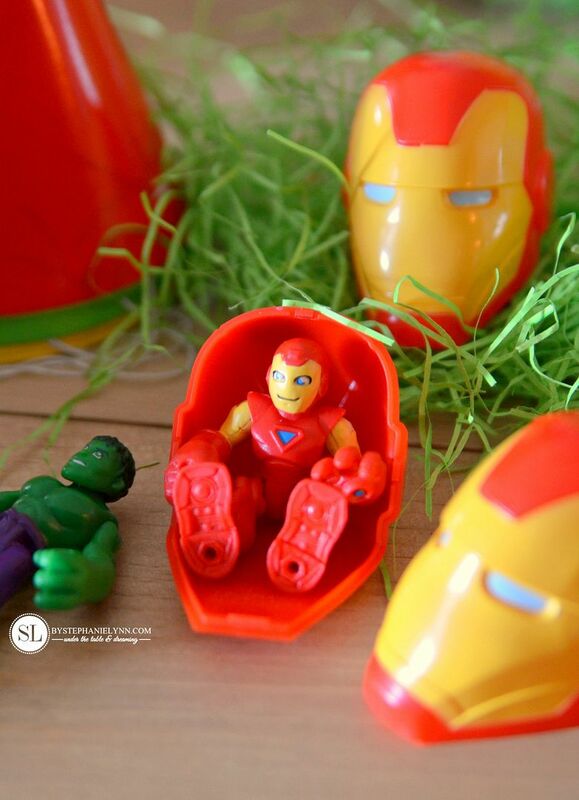 They even have a dedicated Marvel themed spot in their Easter section this year. 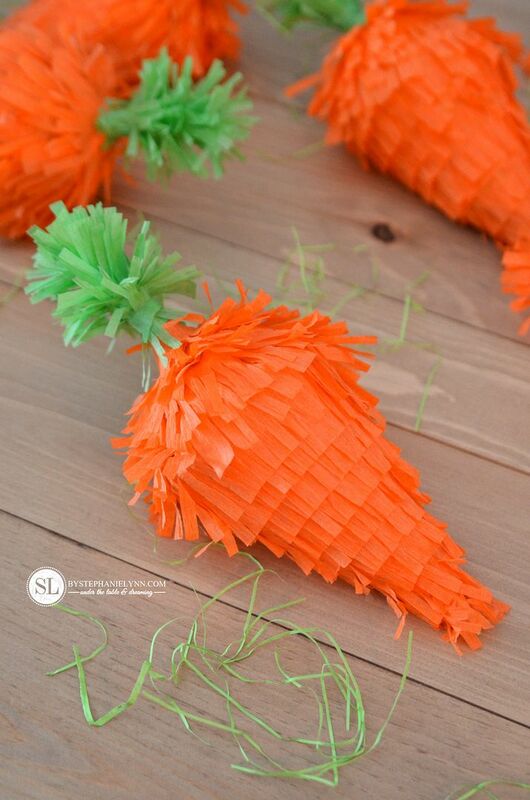 For bigger items, roll and cut a piece of posterboard into the shape of a party hat to create a larger cone. 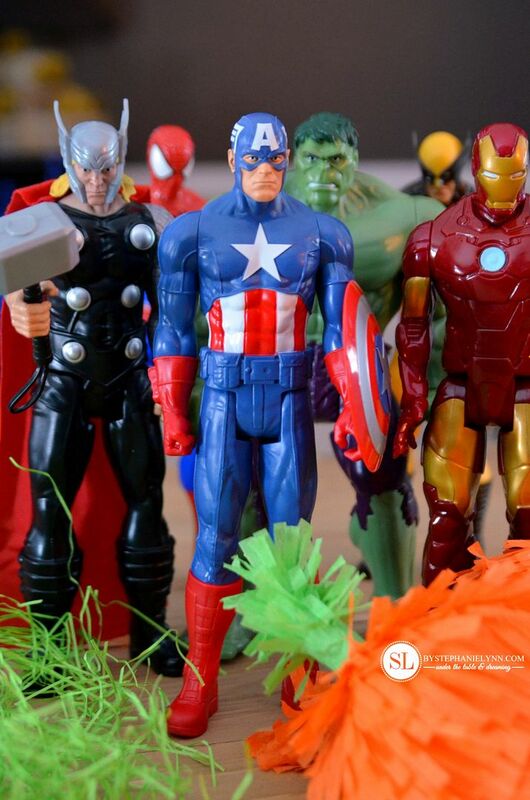 I made them for these 12 inch Avengers Figures and the posterboard works perfectly. I just used a little tape to hold things in place and a bit more tissue paper. What wonderful timing our son has so many food allergies so a traditional basket is out. This is perfect timing. Thank you for sharing with us. Happy Easter in advance. I LOVE this, so stinkin cute! Thanks for sharing! So cute! I am definitely going to try it this year! Thanks. This is such a cute idea! I know my girls will love these.